2017 marks 40 years since the first 'Technical sets', as they were called then, were released in Europe. 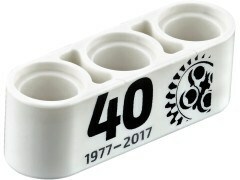 To commemorate the anniversary every 2017 Technic set will come with a special printed white 1x3 beam, as images uploaded by LEGO today for 42057 Ultralight Helicopter show. One side of the boxes will have a '40 1977-2017' logo on them, too, which you can see after the break. Really? I quite like the line-up this year. I don't buy much Technic (other than helicopters), but I like all of these - particularly the Tracked Racer. Though I can see several of these look a lot more about 'design' rather than 'function', which I guess could put some fans off. I'll pick up a set so I can get the special piece, I really like it. The 2H of 2017 will probably have some great models, wait for the toy fairs and I am sure we will see some cool stuff still to come. Kind of sad it is a new Technic piece and not an old technic piece. I agree, the lineup could be better: the Helicopter, and the pullback sets are too simple. But the more expensive Ocean Explorer and BMW are really stand out and have really great quality (based on the images). Does such a thing as a tracked race car exist? Unless Lego have something special up their sleeves that we don't know about, I think the 40 year anniversary is going to be a let down. What would be really special would be a re-release of one of the very first technical sets. I'll have my 40th birthday in 2017 as well. I don't usually buy technic but I might get one with this special brick to mark the occasion. bok2: look up the Ripsaw. Was one of the vehicles in Mad Max Fury Road, even. The smaller sets are rarely anything special. That's why I always go for the larger ($100-$250) Technic sets; now those are real marvels of LEGO model design. Do want to get that brick though, and this batch of sets has a few interesting models (looking at the BMW, Ocean Explorer, and RC tracked racer). I'm hoping they are saving the best technic sets for 2H 2017. Surely they must have something special in the pipeline for the 40th anniversary. A 40th anniversary 853 or 8860 would be great too!!! It'd be a bit more poetic if the gear pictured were a 40-tooth gear! But overall it's a cool bonus and it's great that they're commemorating this anniversary! ^ just came here to say that, too! @LukaMull: Lego typically only engraves bricks for things like codes or serial numbers that vary between sets. And considering that this part will appear in every Technic set next year, from the smallest to the largest, I don't know whether they could even fit a long enough number on a part like this! I'm with rslotb above: if any series deserves a reissue, it's the early Technic sets. If I had to choose between my childhood favourites http://brickset.com/sets/920-2/Rocket-Launch-Pad and http://brickset.com/sets/854-1/Go-Kart, it would have to be the latter for sheer innovation. Christmas day 1979, five o' clock in the morning: my first ever glimpse of sophistamacated (to my ten-year-old eyes) notions as pistons, racks, and universal joints. Even having to apply the '9' sticker didn't dampen my mood. In 40 years I still think the bar is set highest with the Air Tech Claw Rig. A handful of sets have come close, but I don't personally think they have struck that same balance of complicated-but-easy-to-use functionality with a Lego-esque design. We may yet see something up to that level next year though in the Summer wave. The BMW bike is a good omen. @The Rancor: totally agree with you, in my opinion 8868 is still the pinnacle of the Technic serie, it would be great to reissue that set (even in studless version) to celebrate 40th anniversary.